Kids' Book Review: Review: I Think, I Am! Review: I Think, I Am! Title: I Think, I Am! 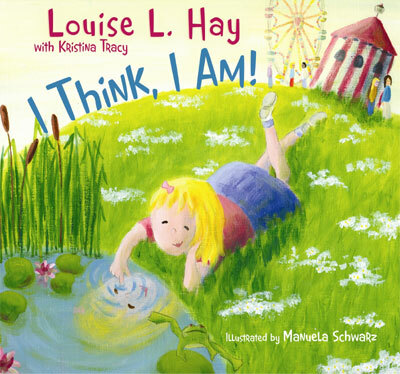 About: The ultimate queen of positivity and zest for life, Louise L Hay, has penned a children’s book centered on the scientifically-proven idea that affirmative thinking has the power to change lives, and – indeed – create literal, physical outcomes that can benefit both individuals and the greater world. I Think, I Am! opens with a note on the difference between a negative thought and a positive affirmation, and how children can capture negativity and turn it around. It encourages children with a variety of scenarios in a fairground setting. A variety of children in different shapes, sizes and colours are used through the book in other scenarios. When a little boy holding a green apple eyes off a row of toffee apples dipped in sprinkles, he momentarily laments his luck before thinking, “I am grateful for what I have,” as he shares his fresh apple with some farmyard piglets. Each double-page vignette continues to encourage children to see their thoughts for what they are, and take control of the way they perceive life and their place in it. In a world where children are increasingly lamenting and ungrateful for what they already have, this book is a precious way to help kids understand that the way they think creates their reality. If kids can learn to automatically gear their minds towards positive leanings at a very young age, they’ll have an enormous psychological headstart in life, that’s virtually certain. With special tips from the master on the best way to do affirmations, this lovely book, packed with bright illustrations, is a beautiful way to teach kids the power of words and the unlimited potential of thought.